Squirrly SEO plugin is a WordPress plugin helps bloggers to improve their website rankings and organic traffic by incorporating white hat SEO techniques to blogs. Squirrly SEO is designed in such a way that it starts adding SEO values when the blogger starts writing article. It acts as a checklist to ensure that all the SEO properties are added to the blog post before it went live. It also continuously monitors the article ranking in Google. It is compatible with other WordPress SEO plugins like Yoast SEO, All in one SEO plugin etc. How Squirrly SEO plugin increase traffic? Finding right Keyword is very important for blog post. Even though you wrote a killer post, if you didn’t add a perfect keyword then it’s not going to rank high in the search engines. SEO by squirrly plugin has an auto complete keyword textbox which helps bloggers to identify perfect long tail keywords for the blog post. 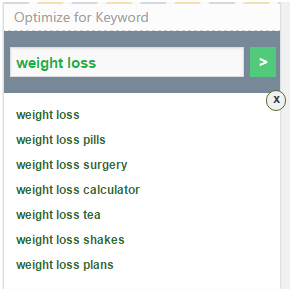 For example, you are going to write an article on “weight loss” then you can check the related and relevant keywords by typing “weight loss” in the textbox as shown below. Pick the one which perfectly suits your article. URL structure plays a vital role in the search engine ranking. I’ve already written the post on importance of URL structure. Squirrly SEO plugin ensures that keyword picked from the textbox is present in the URL. 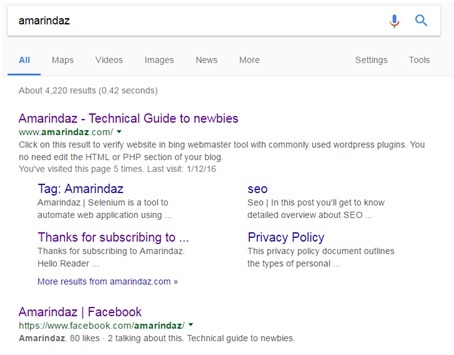 If the keyword you want to rank for the post is present in the URL, then it’s get highlighted in the search results when user search query contains your keywords. Below image is a Google search results where you can see that URL contains keyword “weight loss” shown in bold format. It increases the user click through rate (CTR). The title should be catchy and relevant to the content of the post. The title tag is critical to both search engine and users. 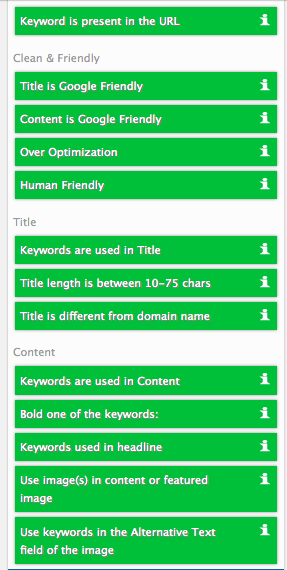 Squirrly plugin checks the title contains keyword and length of the title should be in between 10-75 characters. It also checks title is Google friendly and not over optimized. When blog title contains the keyword, some search engines like Bing highlight it in bold. When a user uses a keyword in his search query then it’s get highlighted in the search result and also increase the click through rate. Squirrly check the keyword is present in the Header and body in a natural way with proper density. Keyword density defines the number of times keyword present in the article. For better SEO, keyword density should lies between 1 to 3%. If the keyword density exceeds the limit then the search engine may penalize the websites for keyword stuffing. Squirrly eliminate this problem. It also ensures that one of the keywords is highlighted in bold format. Also, it checks for keyword present in the first sentence of the article for better optimization. A picture is worth a thousand words. Search engines are not an exception to this proverb. As soon as you enter your keyword in the textbox, it’ll show a related copyright free images (if present) to bloggers. You can design your own images which could be the pictorial representation of your content and place it in the article. Before uploading the image, check whether the keyword is present in the image name. Image name should not be something like “Image_001.jpg”. It should be meaningful and related to your post like “Weight loss in one month.jpg”. 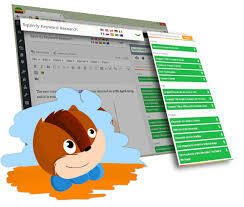 Squirrly SEO plugin compares the keyword with a domain name and ensures that keyword is different from the domain name. Having keyword in domain name add SEO and help you to rank higher. For example, www.weightloss.com. As per the recent Google updates, low-quality websites with the keyword in the domain are penalized. 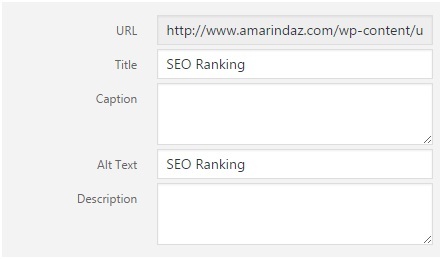 If you use the same keyword for your blog post then obviously URL contain keyword repeated two times and its look like a spammy URL structure. www.weighloss.com\weight-loss-easy. If you see this URL structure, keyword “weight loss” is appeared two times. One is in the domain name and another one in the Permalink. There is no doubt that Google will penalize the websites for this spammy permalink structure. The six heading elements H1 to H6 define the different level of headings in the HTML document. Squirrly SEO plugin verifies that keyword is present in any of the header elements. I recommended using Keyword in H1 section because it stands unique and easily picked by search engines and help your reader to understand what the page is about. If your article has many headings, then use H1 for one time with the keyword at the front and use H2 or H3 for remaining headings. 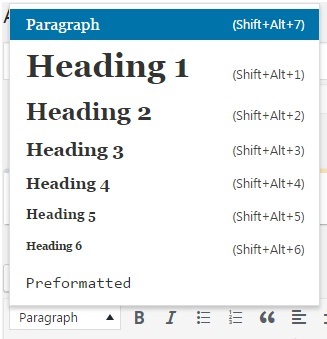 In the WordPress toolbar, you have an option to change the header as shown below. Google search console and bing webmaster are the two main tools help bloggers to monitor the website performance. You can easily sync those tools with Squirrly SEO plugin. 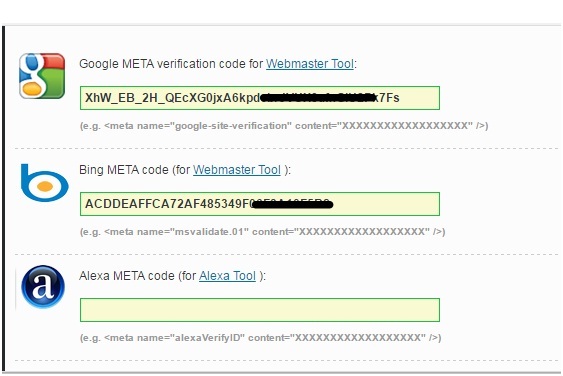 You can easily verify the Google webmaster and Bing webmaster by just copy paste the Meta IDs. 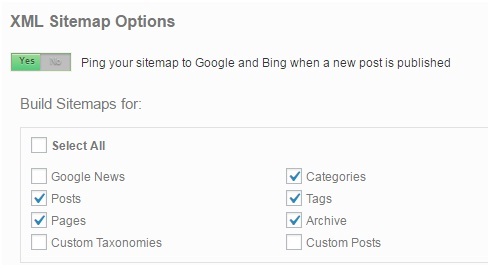 Go to Squirrly SEO Plugin in the left sidebar-> Settings and scroll down. XML sitemap is an XML file that lists the URL for the site which helps search engine to understand the content, updated time and changes made. XML sitemap is a backbone of the blog. Squirrly SEO plugin helps you to build different XML sitemaps and automatically update the Google webmaster when a new content is published on your blog. Go to Squirrly -> SEO-> Google XML sitemap to create sitemaps. Social media like Facebook, Google plus, twitter, LinkedIn, Pinterest and Instagram adds SEO as soon as the content is published. When you are done with publishing share it across all social media profiles and let the search engine knows about it for fast optimization. Normally search engine takes minimum three days to crawl the new content in a blog but you can make it faster with the help of social media. 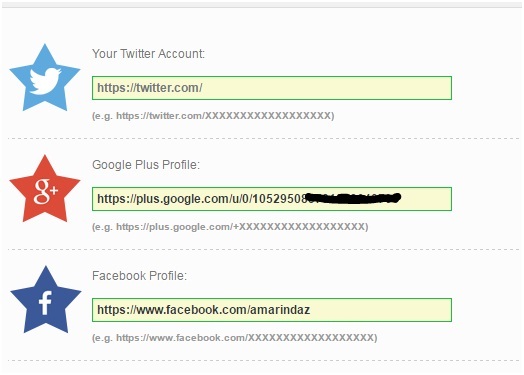 Squirrly easily link your social media profiles with the blog. Squirrly SEO plugin doesn’t stop its job with just publishing the SEO blog post. It continuously monitors the Google ranking for the keywords and updates with the current position in Google. 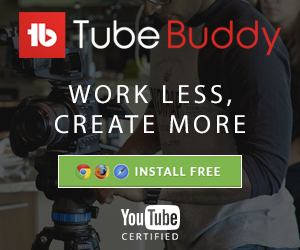 This is one of the greatest value added service to bloggers. By default, it shows www.google.com rank. If you are targeting by country then you change the Google extension accordingly. Go to Squirrly -> Settings- > Google rank options. After I started using Squirrly SEO plugin, I could see 30-50% hike in organic traffic to my blog so just thought of sharing it. The primary motive of Squirrly plugin is to ensure that article is 100% optimized. You can check the Squirrly pricing plans. If you already have Squirrly SEO plugin in your blog kindly share your experience in comments. Let me know if you need further information about this SEO plugin. Great article! Thanks so much for writing this awesome review about Squirrly SEO!